Scry - Transform how the future's predicted. Learn. Challenge. Most of us face important decisions every day. Don’t leave them to chance. Scry helps you sharpen your strategy skills to give you a better idea of what’s coming down the road - in your personal and professional lives, as well as important events in the wider world. Startling new research has shown that, when it comes to predicting, it isn’t what you know that counts - it’s how you think. Processing information a certain way turns your brain into a forecasting machine. And Scry can teach you how. 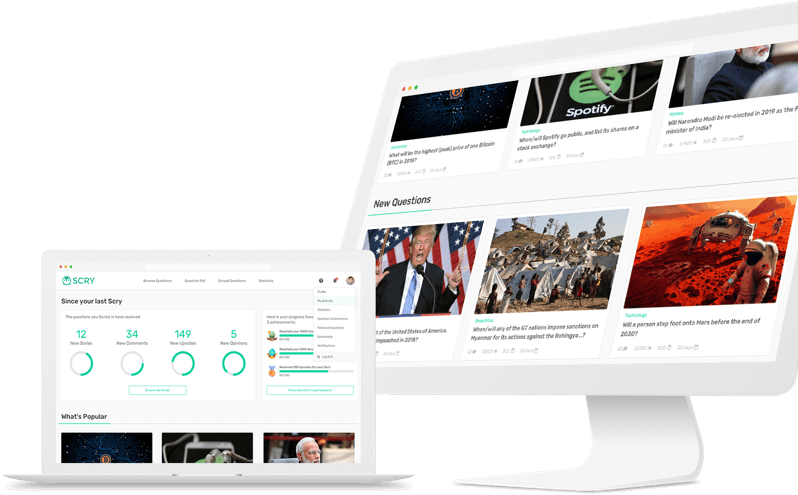 We’re looking for people interested in building a community of Scryers - those who think in a way that better helps them see and foresee world events. Will you help us change the world? Most of us are daunted by the sheer scale of the future when asked to make a prediction. By breaking down your assumptions of what you know and what you don’t, you’ll be able to find more manageable issues that can be tackled individually, then put back together to form a more complete understanding of the future. Don’t worry - you won’t get a “Maybe” or “Maybe not”. We’ll give you a precise percentage probability of a given event occurring, based on your calculations. Scry is a community - you’ll get to know like-minded people all over the world, and your discussions will fuel the work we do. We encourage you to keep an open mind. When other people disagree with you - and they will - you’ll have the opportunity to really understand their point of view. When you make a prediction, we’ll track its accuracy - and compare it to others around the world. After the event, you’ll see where you rank on the Scry leaderboard. Practice won’t ever make perfect in the predicting game, but it will help. Massively. You’ll see your accuracy score improving and your decision-making skills getting sharper the more you Scry. by looking into a medium such as a mirror or crystal ball. Accuracy-driven, holistic perspectives, from all of us.